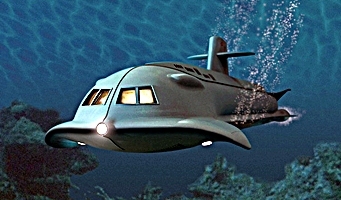 This was a marine theme sci-fi adventure that was based way in the future, all the way to the late 1970s – early 1980s …. imagine that. Seaview the submarine was the real star of the show, built by scientist genius Admiral Harriman Nelson (Richard Basehart) presumably for peaceful research the sub and her crew wind up taking on cold war adversaries, new want-to-be world dominator’s and a whole host of really weird sea creatures. The sub was commanded by Captain Lee Crane (David Hedison) but Admiral Nelson usually wound up calling the shots. 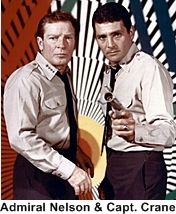 This show was the longest running sci-fi show, which proved its popularity, but it was really very campy. 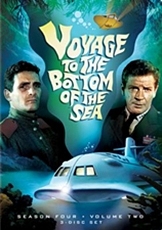 The first season had the dauntless crew fighting evil men intent on world destruction but as the show rolled on the plots got more and more bizarre, with 1950s style sea creatures, dinosaurs, and trips into the future or past. 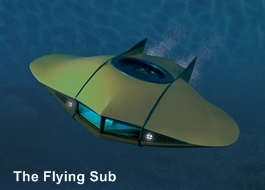 One really cool thing on the show was the Flying Sub. Looking like a stingray the small sub carried two people and could zoom around underwater or leap out of the ocean and fly (with jet power) through the air. The Seaview for being ostensively a peaceful research ship sure did carry a lot of firepower. She had torpedoes, missiles (nuclear when needed) and an underwater laser thing which could hit its target without disrupting the water around it (Spock would say, “fascinating”). 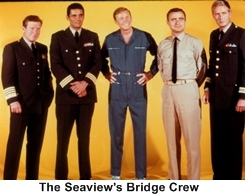 The show was directly derived from the 1960 movie by the same name starring Walter Pidgeon as Admiral Nelson which was written and produced by Irwin Allen who also created and produced the tv show. The original credit however I believe must be given to Jules Verne and his “Twenty Thousand Leagues Under the Sea” which was written in 1870. Arch Whiting passed away in 2007, he was 70 and Terry Becker died in his sleep in 2014, he was 93. 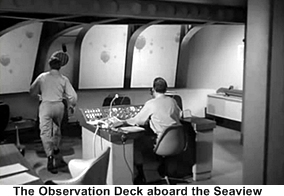 If you think that you recognize some of the technology (blinking lights and cool looking knobs) from the Seaview you do. A lot of the props used in “Voyage” were reused in “Lost In Space (1965)”, “Batman (1966)”, “Time Tunnel (1966)”, and “Land of the Giants (1968)”.